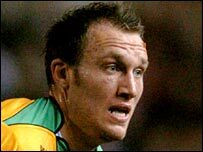 Norwich boss Nigel Worthington says top scorer Dean Ashton missed the FA Cup loss to West Ham because of injury and not because he is about to be sold. "He has got a groin strain and for those who think I'm telling porky-pies, I've got a scan which proves he has damaged his groin," he said. "He's on a long-term contract, and unless there's a crazy offer which comes in, he is staying at this club. "There'll be a right time for him to go but it's not right for him or us." Worthington said he had no news yet on the fitness of keeper Robert Green, who was carried off late on after diving at the feet of West Ham striker Marlon Harewood. "Rather than speculate, he will be fully assessed and hopefully he should be okay," said Worthington. "It was just two bodies coming together in an honest challenge, and is just one of those unfortunate situations."